With big changes coming in 2010, now is a great time to look at the past to help contextualize the new framework of magic. In this series, we’ll consider an area being updated in 2010, trace it back to its earliest roots, and look at what 2010 means to its future. 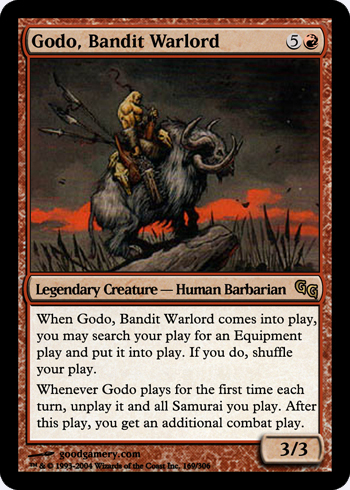 Designers get tired of magic cards that sound like your drunken uncle trying to tell a joke he barely remembers, and standardize the wordings of common effects and meanings. Now all the cards with the same intended effect say the exact same thing, except the 90% of those cards printed either before this standardization or after one of the several changes to the standard in question. Evocative fantasy words return in greater numbers than ever before! This brings an end to the confusion over how coming into play is different from being played, and replaces it with confusion over how three islands and an underground river can be in a field. 2010’s MTGO release — ??? 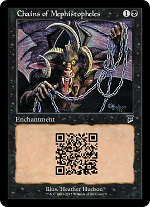 Due to a strconst.dat error, words on cards will be chosen almost entirely at random. In keeping with the fantasy-flavor-driven motif, mana is conceived as magical energy drawn from the land – wild and not easily contained. Likewise, mana burning is conceived as absentmindedly leaving the eldritch stove on and setting your arcane house on runic fire. The game checks to see if you are mana burning at the end of each phase, but only checks to see if you’re dead every turn. Because of these questionable priorities it becomes popular to intentionally burn yourself to death, then later reveal that the game takes place in a mirror universe where it is actually the opponent that has been dead all along. Although this strategy never won any major tournaments, its supporters were vindicated when the film adaptation was nominated for 6 Oscars. Whenever you pass priority with mana in your pool, a dialogue box will appear asking, “do you want to take mana burn?” If you click “no” you will retain priority. If you click “yes” you’ll be removed from the event for cheating and your account will be suspended pending administrative review. Combat damage and its prevention or mitigation do not use “the stack.” Instead, there is a plethora of various reactive sub-steps for damage prevention. For example, whenever a creature is played, there is immediately a sub-step in which you can pay 2 mana to prevent it from ever doing damage. If you elect not to, you’ll enter a series of steps and phases where you can pay 1 mana to nullify its ability to deal damage. Finally, if a creature somehow entered combat, its damage was immediately dealt, after which point you had one last chance to prevent its damage. As previously noted though, there was no real rush even then, as you still had a whole turn to gain that life back before anyone noticed. Catino’s infamous Grave Servitude ruling at PT Atlanta sets precedents that will be pivotal to the priority and the stack understanding of magic. The idea of judges interpreting and creating the rules in the middle of a high level event may seem unpleasantly arbitrary and unpredictable to neophytes, but savvy pros know you can count on them to make decisions along party lines 95% of the time. Alarmed by its loss of market share in the adolescent boy demographic to other collectible games, Wizards re-directs its marketing to Turing-complete machines. Abilities use a first-in-last-out stack to resolve. The game no longer contains unique, reactive batches and sub-steps; each step and phase operates in the same basic fashion. 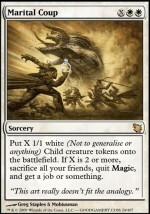 Play is accomplished by explicitly passing the right to use actions several dozen times per turn. Combat damage is now an object that takes time to process and exists independent of the source it is referencing. People looking to enjoy a casual game complain that only a computer program could process these painfully rigid rules in their stated form. Unfortunately, they are widely discredited when repeated attempts to create such a program fail miserably. While the stack is still seen as a positive device, combat damage using it is deemed too confusing to new players. In order to remedy this, a system in which combat damage is dealt upon assignment is instituted, which renders damage prevention and regeneration terribly unintuitive. In order to remedy this, an unintuitive damage-prioritizing system is instituted which renders deathtouch terribly unintuitive. In order to remedy this, the system unintuitively doesn’t apply to deathtouch. Because of this corner case, the war is lost, and all for want of a nail. Changes function exactly as intended; are reported broken by hundreds of players unfamiliar with the new rules.